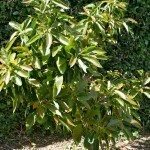 Do I need another avocado tree in my yard before the mature one that I have will bear fruit? Yes, unless you will be hand-pollinating the tree yourself. Avocado trees produce flowers that have separate male and female phases. For example, when the flowers open, they may be female one day and male the next. Type A trees are female in the morning and male in the afternoon. Type B trees open with female flowers in the afternoon but are male in the morning. You need the opposite type as a pollinator, or save the pollen one day and use it the next to pollinate the tree by hand.